JLab approaches its product designs with a “go big or go home” attitude, which has resulted in products like the Bombora headphones and Crasher Bluetooth speaker. This time, the folks at the California-based audio company have announced a new set of earbuds with a name as audacious as its attitude: the Epic. Though touted as “earbuds reimagined,” the Epic sport more of a half in-ear design – similar to what we’ve seen with some of Phiaton’s in-ear offerings – which we’ve found helps block more noise, keep the ‘phones in place, and enhance bass. On those three points, the Epic are successful. In fact, these buds’ bass response is arguably their most epic attribute. The half in-ear design helps, but most of the credit for the bombastic bass should probably go to the Epic’s massive 13mm drivers. Second to the bass response is the Epic’s selection of ear tips (6 pair) and “Cush Fins” (4 pair) which team up to offer a secure fit and excellent noise isolation. The Epic also feature a tangle-resistant flat cable and a single-button inline control microphone. 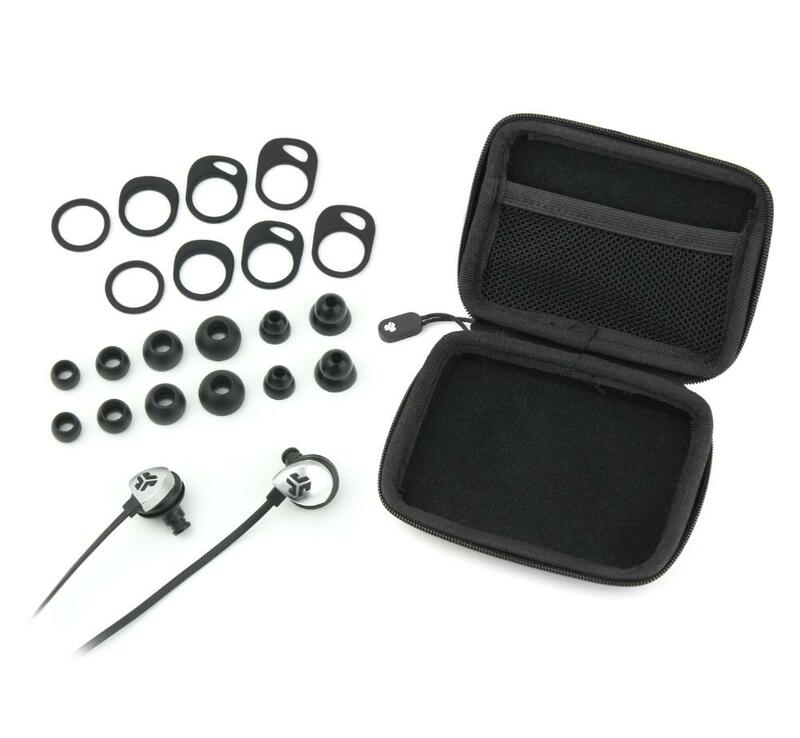 Included in the box is a surprisingly sturdy travel case with a mesh pouch for toting along extra ear tips. Lest you think we were kidding about the big bass thing, let us reiterate: JLab’s Epic in-ear headphones will crush your cranium with eardrum-pounding, ultra-deep bass response. We can’t recall testing an in-ear in the last couple of years that can best them in that regard. Thankfully, the highs still make it through with some solid clarity while the midrange, though somewhat outpaced, is still present enough to make vocals intelligible and instruments like horns sound warm. There’s even some decent dynamics at play; surprising, considering how bass-centric the Epic tend to be. Sure, we’ve got a few gripes: There’s some occasional sibilant sharpness that comes to the treble from time to time; plus, the 13 mm drivers are so large, it’s impossible to forget you’re wearing these earphones. Still, for $50, the Epic manage to offer a relatively decent level of fidelity. Plus, did we mention that they crank out some serious bass? You can pick up a pair of JLab’s Epic earphones at Amazon in either black or blue colors right now.